Y-a-t-il un facteur religieux spécifique en Psychopathologie? 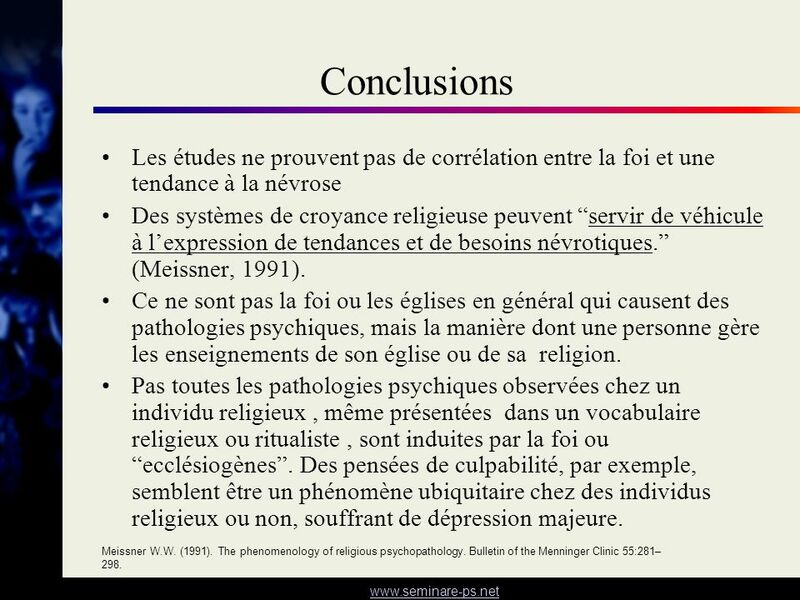 1 Y-a-t-il un facteur religieux spécifique en Psychopathologie? 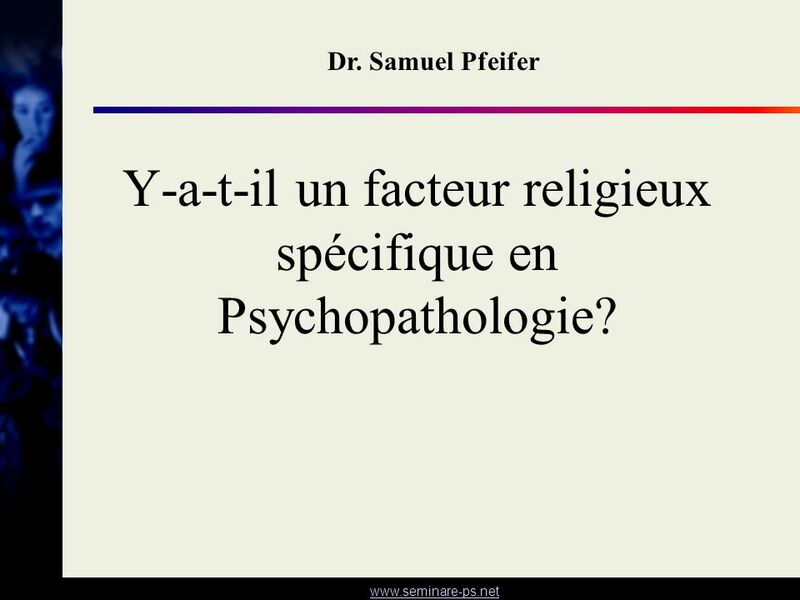 Dr. Samuel Pfeifer Y-a-t-il un facteur religieux spécifique en Psychopathologie? Secrétaire de 19 ans, sa mére décède lorsqu’elle a 15 ans. Quelques semaines avant notre entretien , elle a été violée. “Peut-être que d’autres sentent la présence de Dieu. Moi pas. J’ai cru en Lui; j’ai lu ma Bible; J’ai prié. J’ai cru qu’Il m’aimait et veillait sur moi. Mais pourquoi n’entendit-il pas mes prières au chevet de ma mère? Pourquoi n’a-t-Il pas vu les angoisses de mon père? Si Dieu existe, il devait dormir! Je ne désire plus rien entendre sur Dieu . La foi me rend malade!" A 19-year old secretary consulted me with major depression. At the age of 15, she had lost her godly mother, whom she had loved very much. A few weeks before our interview she had been raped. In her first consultation she says: "Maybe others do feel God's presence. I don't. I have believed in him; I have read my Bible; I have prayed. I thought that he loved me and watched over me. But why didn't he hear my prayers at the bedside of my mom? Why didn't he see the anguish of my father? If there is a God, he must have been sleeping! I don't want to hear anything about God anymore. Faith is making me sick!" A 28-year old teacher suffering from a severe anxiety disorder and a pervasive lack of energy was forced to give up his job. His father was a successful manager, a man without time for his family and no interest in religion. His mother was a rather sensitive, warm woman. Whereas his brother and sister both were able to fulfil their parents' expectations, he was "a failure". In a time of intense crisis and anxiety during his college years he found Christ. But despite his hopes, the anxiety did not abate, rather it now expanded into the area of religion. "I see God as a huge menacing being, constantly observing all my activities and thoughts. There is no way I can hide from him. He demands devotion, holiness and being a testimony for him, but I feel like a bundle, all corded up, without arms and legs. Faith is making me sick!" A 36-year old nurse told me about her life: Both her father and her mother had been alcoholics, and she was placed with a catholic farmer's family in the country. She was a difficult and stubborn girl, and she did not receive much love either. When she was 13, her foster-father started to abuse her sexually. Plagued by feelings of guilt after each incident, he pleaded with her to forgive him. Finally, after 2 years, the foster-mother found out, and under terrible cursing, chased her from the farm. She eventually made her life, but she told me: "I don't want to hear anything about religion anymore. These pious hypocrites have destroyed my life! Religion has made me sick!" Un enseignant de 28ans souffrant d’un troubles anxieux sévères et d’un manque d’énergie envahissant a été contrait d’abandonner son travail. Père sévère, mère attentionnée (les 2 non-religieux). Il est perçu comme un “raté". Durant une période de crise et d’anxiété intenses pendant ses années universitaires, il rencontre le Christ. Mais malgré ses espoirs, l’anxiété ne se relâche pas, au contraire , elle envahit son contexte religieux . “je perçois Dieu comme un Être menaçant, surveillant constamment toutes mes activités et mes pensées. Il n’y a pas moyen de me cacher devant Lui . Il exige de moi de la dévotion, de la sainteté et d’être un témoignage pour Lui, mais je me sens comme un ballot, lié de toute part, sans bras ni jambes. La foi me rend malade!" A 19-year old secretary consulted me with major depression. At the age of 15, she had lost her godly mother, whom she had loved very much. A few weeks before our interview she had been raped. In her first consultation she says: "Maybe others do feel God's presence. I don't. I have believed in him; I have read my Bible; I have prayed. I thought that he loved me and watched over me. But why didn't he hear my prayers at the bedside of my mom? Why didn't he see the anguish of my father? If there is a God, he must have been sleeping! I don't want to hear anything about God anymore. Faith is making me sick!" A 28-year old teacher suffering from a severe anxiety disorder and a pervasive lack of energy was forced to give up his job. His father was a successful manager, a man without time for his family and no interest in religion. His mother was a rather sensitive, warm woman. Whereas his brother and sister both were able to fulfil their parents' expectations, he was "a failure". In a time of intense crisis and anxiety during his college years he found Christ. But despite his hopes, the anxiety did not abate, rather it now expanded into the area of religion. "I see God as a huge menacing being, constantly observing all my activities and thoughts. There is no way I can hide from him. He demands devotion, holiness and being a testimony for him, but I feel like a bundle, all corded up, without arms and legs. Faith is making me sick!" A 36-year old nurse told me about her life: Both her father and her mother had been alcoholics, and she was placed with a catholic farmer's family in the country. She was a difficult and stubborn girl, and she did not receive much love either. When she was 13, her foster-father started to abuse her sexually. Plagued by feelings of guilt after each incident, he pleaded with her to forgive him. Finally, after 2 years, the foster-mother found out, and under terrible cursing, chased her from the farm. She eventually made her life, but she told me: "I don't want to hear anything about religion anymore. These pious hypocrites have destroyed my life! Religion has made me sick!" Infirmière de 36 ans, 2 parents alcooliques; à 12 ans elle est placée auprès d’une famille de paysans catholiques à la campagne. Elle fut une fille têtue et difficile, et n’a pas reçu beaucoup d’amour en partage. A 13 ans, son père adoptif commença à abuser sexuellement d’elle. Torturé de remords après chaque incident , il la suppliait de lui pardonner. Finallement, après 2 ans, la mère adoptive découvrit le pot aux roses et la chassa de la ferme sous de terribles imprécations. Finalement elle se débrouilla dans la vie, mais me raconta : “Je ne désire plus jamais rien entendre sur la religion. Ces hypocrites pieux ont détruit ma vie. La foi me rend malade!" A 19-year old secretary consulted me with major depression. At the age of 15, she had lost her godly mother, whom she had loved very much. A few weeks before our interview she had been raped. In her first consultation she says: "Maybe others do feel God's presence. I don't. I have believed in him; I have read my Bible; I have prayed. I thought that he loved me and watched over me. But why didn't he hear my prayers at the bedside of my mom? Why didn't he see the anguish of my father? If there is a God, he must have been sleeping! I don't want to hear anything about God anymore. Faith is making me sick!" A 28-year old teacher suffering from a severe anxiety disorder and a pervasive lack of energy was forced to give up his job. His father was a successful manager, a man without time for his family and no interest in religion. His mother was a rather sensitive, warm woman. Whereas his brother and sister both were able to fulfil their parents' expectations, he was "a failure". In a time of intense crisis and anxiety during his college years he found Christ. But despite his hopes, the anxiety did not abate, rather it now expanded into the area of religion. "I see God as a huge menacing being, constantly observing all my activities and thoughts. There is no way I can hide from him. He demands devotion, holiness and being a testimony for him, but I feel like a bundle, all corded up, without arms and legs. Faith is making me sick!" A 36-year old nurse told me about her life: Both her father and her mother had been alcoholics, and she was placed with a catholic farmer's family in the country. She was a difficult and stubborn girl, and she did not receive much love either. When she was 13, her foster-father started to abuse her sexually. Plagued by feelings of guilt after each incident, he pleaded with her to forgive him. Finally, after 2 years, the foster-mother found out, and under terrible cursing, chased her from the farm. She eventually made her life, but she told me: "I don't want to hear anything about religion anymore. These pious hypocrites have destroyed my life! Religion has made me sick!" 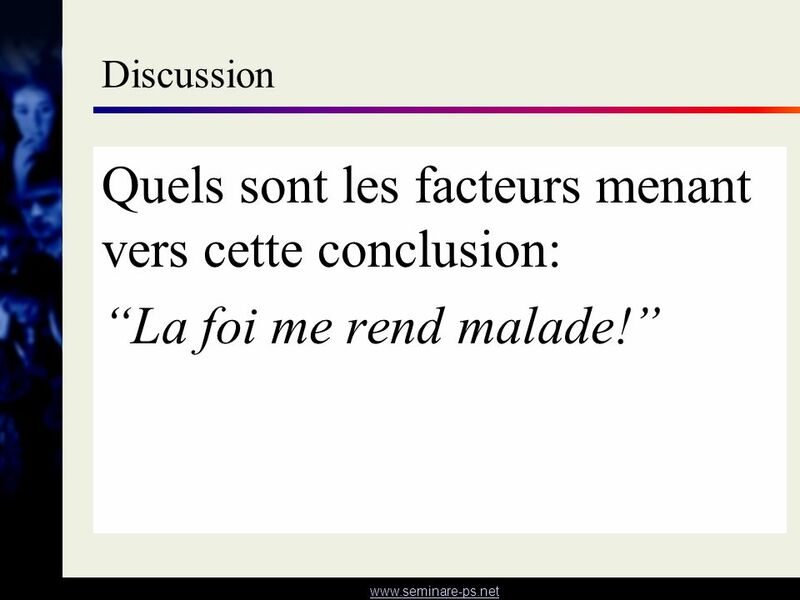 Discussion Quels sont les facteurs menant vers cette conclusion: “La foi me rend malade!” A 19-year old secretary consulted me with major depression. At the age of 15, she had lost her godly mother, whom she had loved very much. A few weeks before our interview she had been raped. In her first consultation she says: "Maybe others do feel God's presence. I don't. I have believed in him; I have read my Bible; I have prayed. I thought that he loved me and watched over me. But why didn't he hear my prayers at the bedside of my mom? Why didn't he see the anguish of my father? If there is a God, he must have been sleeping! I don't want to hear anything about God anymore. Faith is making me sick!" A 28-year old teacher suffering from a severe anxiety disorder and a pervasive lack of energy was forced to give up his job. His father was a successful manager, a man without time for his family and no interest in religion. His mother was a rather sensitive, warm woman. Whereas his brother and sister both were able to fulfil their parents' expectations, he was "a failure". In a time of intense crisis and anxiety during his college years he found Christ. But despite his hopes, the anxiety did not abate, rather it now expanded into the area of religion. "I see God as a huge menacing being, constantly observing all my activities and thoughts. There is no way I can hide from him. He demands devotion, holiness and being a testimony for him, but I feel like a bundle, all corded up, without arms and legs. Faith is making me sick!" A 36-year old nurse told me about her life: Both her father and her mother had been alcoholics, and she was placed with a catholic farmer's family in the country. She was a difficult and stubborn girl, and she did not receive much love either. When she was 13, her foster-father started to abuse her sexually. Plagued by feelings of guilt after each incident, he pleaded with her to forgive him. Finally, after 2 years, the foster-mother found out, and under terrible cursing, chased her from the farm. She eventually made her life, but she told me: "I don't want to hear anything about religion anymore. These pious hypocrites have destroyed my life! Religion has made me sick!" 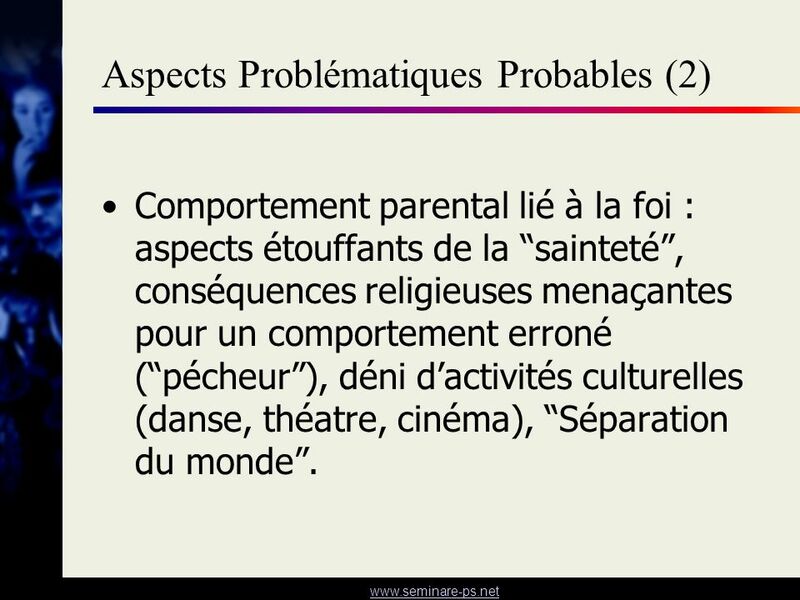 Comportement parental lié à la foi : aspects étouffants de la “sainteté”, conséquences religieuses menaçantes pour un comportement erroné (“pécheur”), déni d’activités culturelles (danse, théatre, cinéma), “Séparation du monde”. 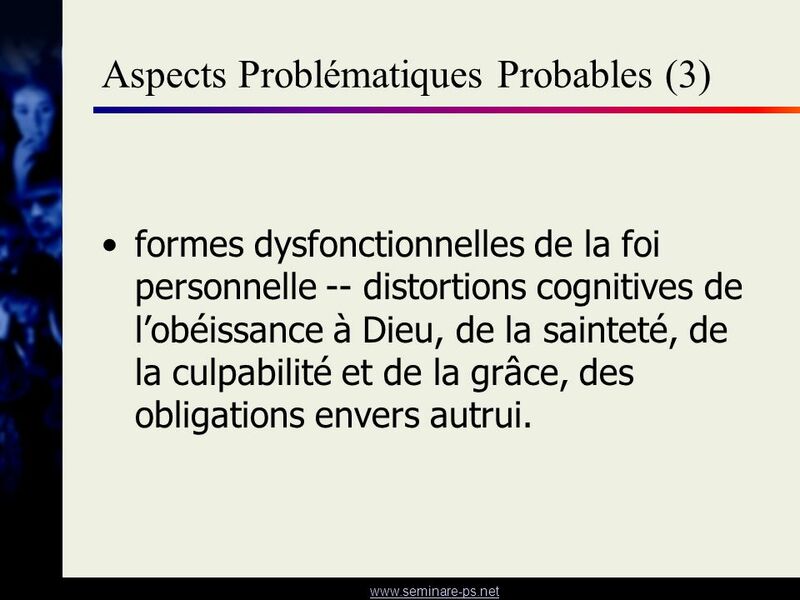 formes dysfonctionnelles de la foi personnelle -- distortions cognitives de l’obéissance à Dieu, de la sainteté, de la culpabilité et de la grâce, des obligations envers autrui. 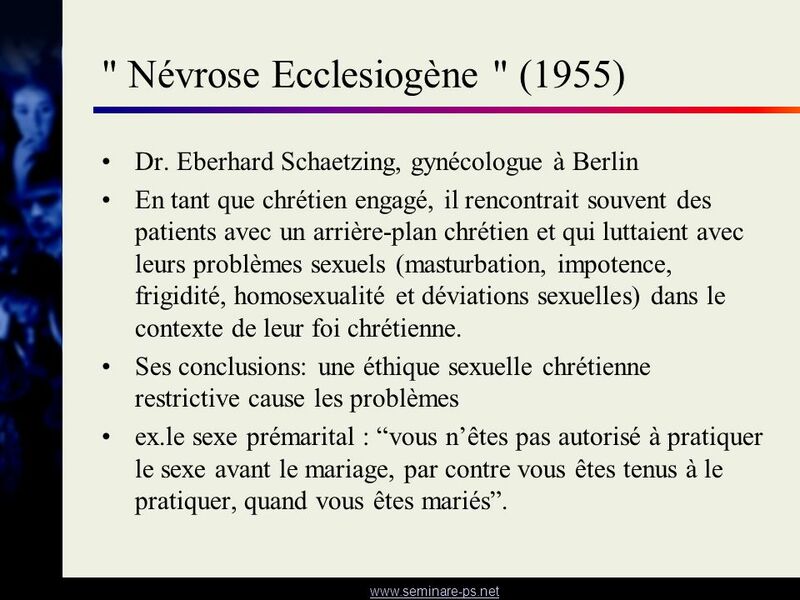 Dr. Eberhard Schaetzing, gynécologue à Berlin En tant que chrétien engagé, il rencontrait souvent des patients avec un arrière-plan chrétien et qui luttaient avec leurs problèmes sexuels (masturbation, impotence, frigidité, homosexualité et déviations sexuelles) dans le contexte de leur foi chrétienne. Ses conclusions: une éthique sexuelle chrétienne restrictive cause les problèmes ex.le sexe prémarital : “vous n’êtes pas autorisé à pratiquer le sexe avant le mariage, par contre vous êtes tenus à le pratiquer, quand vous êtes mariés”. 12 Mise Au Point Sélective? Des thérapeutes chrétiens travaillant exclusivement avec des clients chrétiens semblent être spécialement enclins d’arguer des causes spécifiquement reliées à la foi pour leurs problèmes, négligeant le fait que le même processus dysfonctionnel peut aussi survenir chez ceux qui qui ne sont pas religieux . Leurs modèles de causalité sont souvent issus d’un groupe sélectif de patients combiné avec une focalisation sélective dans la définition de la problématique. 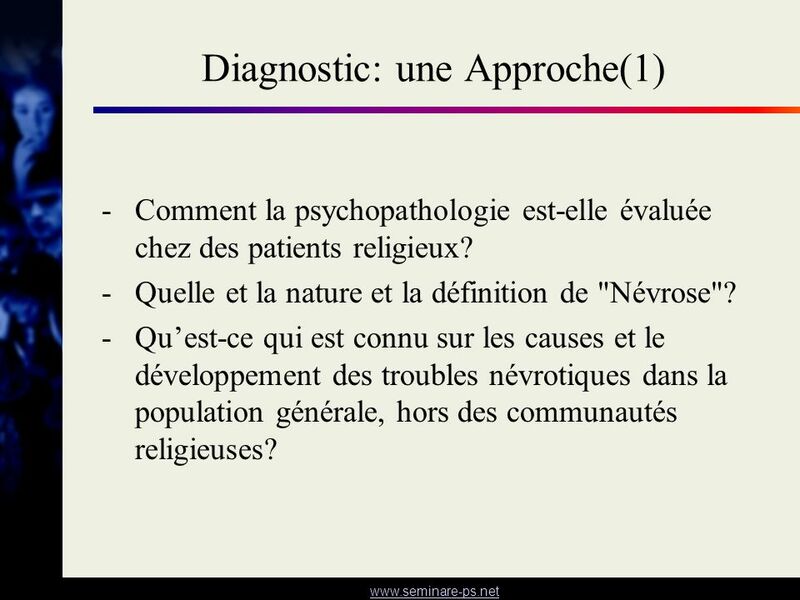 Comment la psychopathologie est-elle évaluée chez des patients religieux? Quelle et la nature et la définition de "Névrose"? Qu’est-ce qui est connu sur les causes et le développement des troubles névrotiques dans la population générale, hors des communautés religieuses? 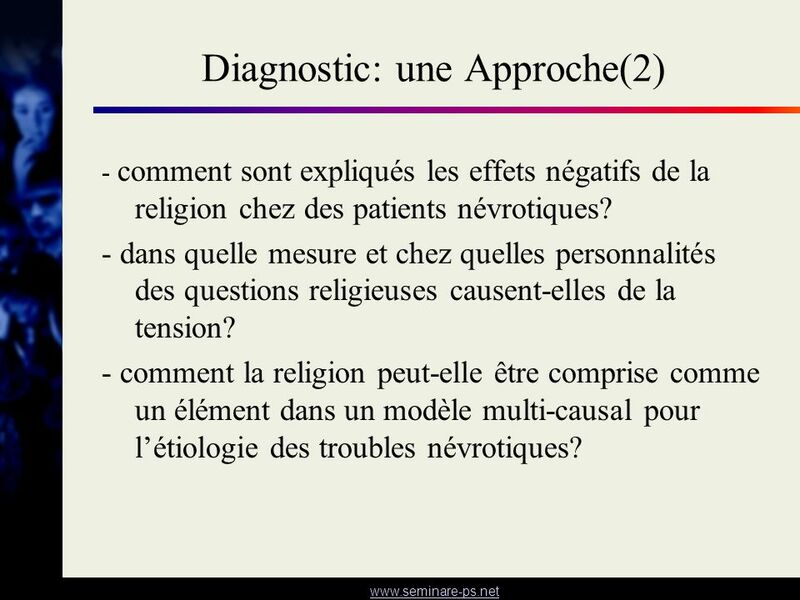 - comment sont expliqués les effets négatifs de la religion chez des patients névrotiques? - dans quelle mesure et chez quelles personnalités des questions religieuses causent-elles de la tension? 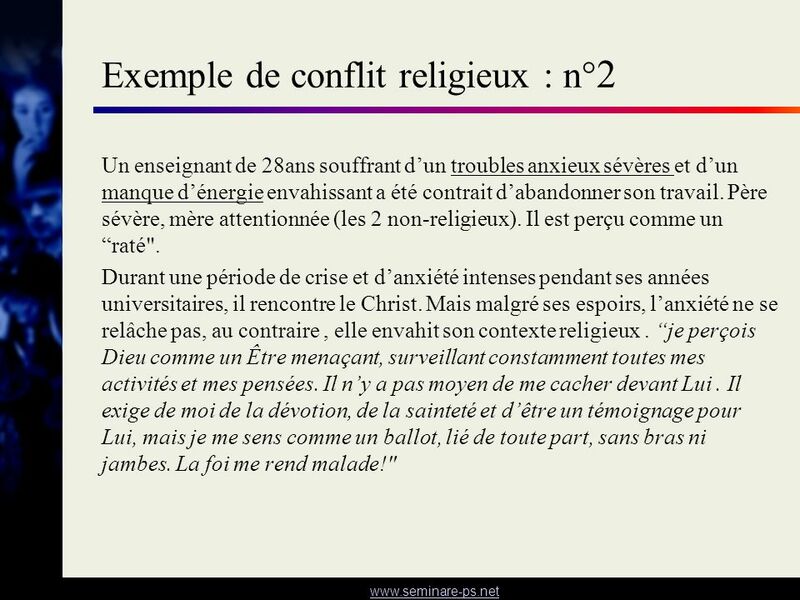 - comment la religion peut-elle être comprise comme un élément dans un modèle multi-causal pour l’étiologie des troubles névrotiques? Les variables dures sont neutres ou reflètent les valeurs générales consensuelles (ex. 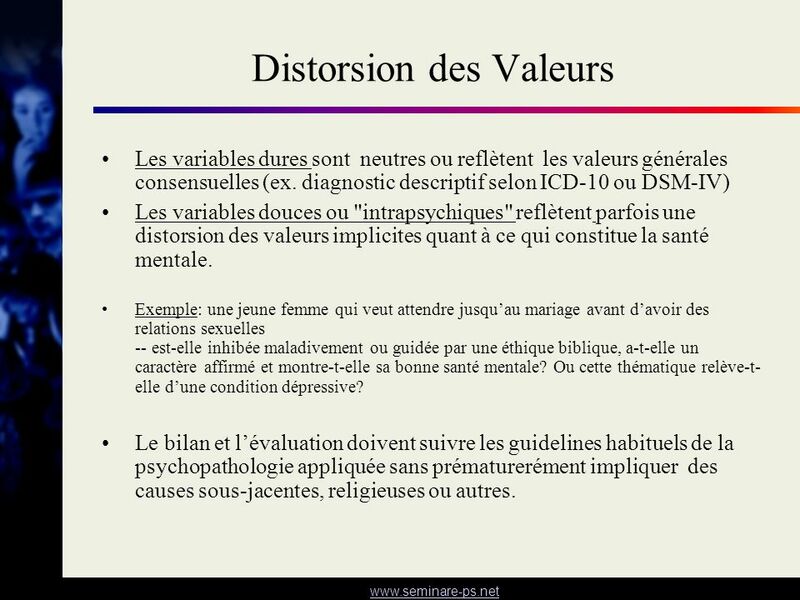 diagnostic descriptif selon ICD-10 ou DSM-IV) Les variables douces ou "intrapsychiques" reflètent parfois une distorsion des valeurs implicites quant à ce qui constitue la santé mentale. Exemple: une jeune femme qui veut attendre jusqu’au mariage avant d’avoir des relations sexuelles -- est-elle inhibée maladivement ou guidée par une éthique biblique, a-t-elle un caractère affirmé et montre-t-elle sa bonne santé mentale? 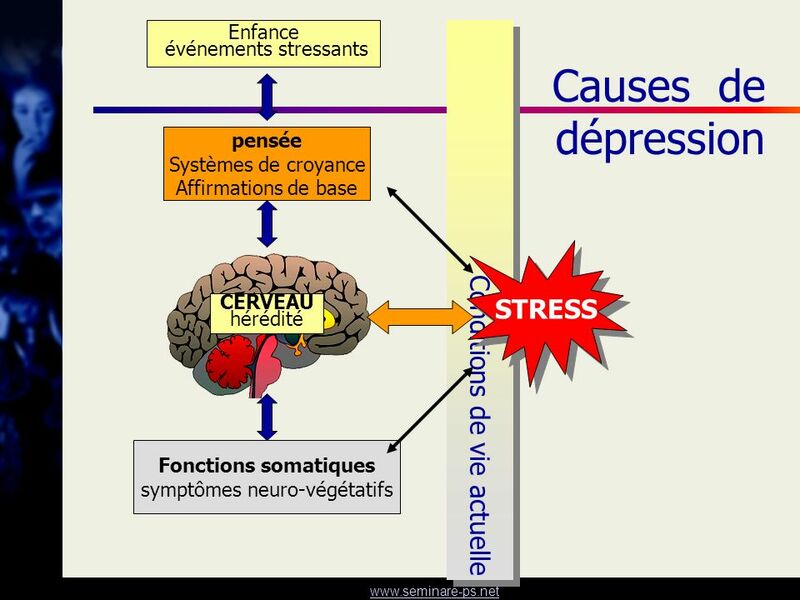 Ou cette thématique relève-t-elle d’une condition dépressive? 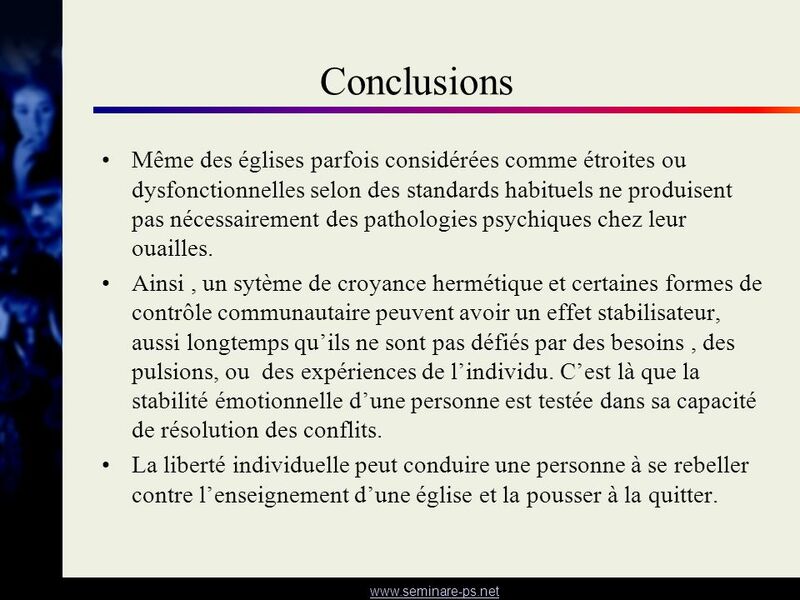 Le bilan et l’évaluation doivent suivre les guidelines habituels de la psychopathologie appliquée sans prématurerément impliquer des causes sous-jacentes, religieuses ou autres. 17 Dépression „Quand je me sens abattue, j’ai l’impression que Dieu m’a abandonnée. Je ne ressens pas Sa Présence et ne peux concevoir qu’Il m’aime encore. 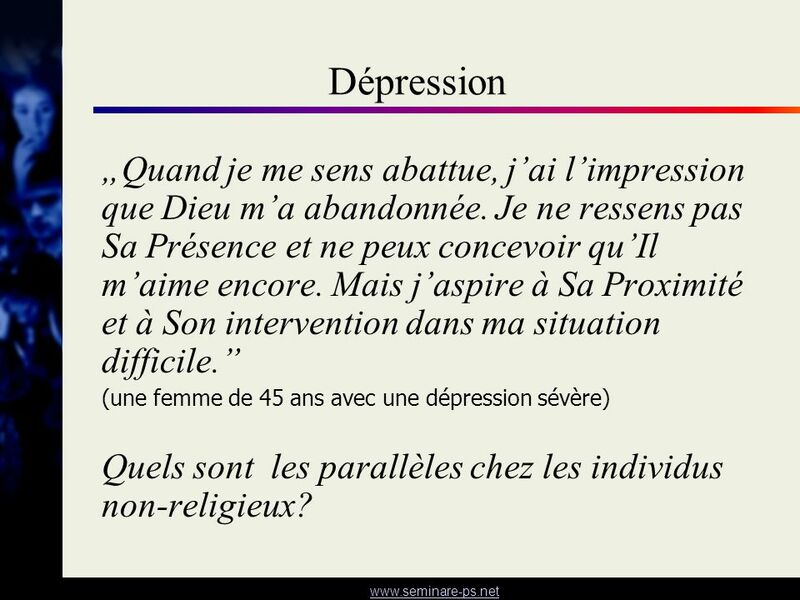 Mais j’aspire à Sa Proximité et à Son intervention dans ma situation difficile.” (une femme de 45 ans avec une dépression sévère) Quels sont les parallèles chez les individus non-religieux? 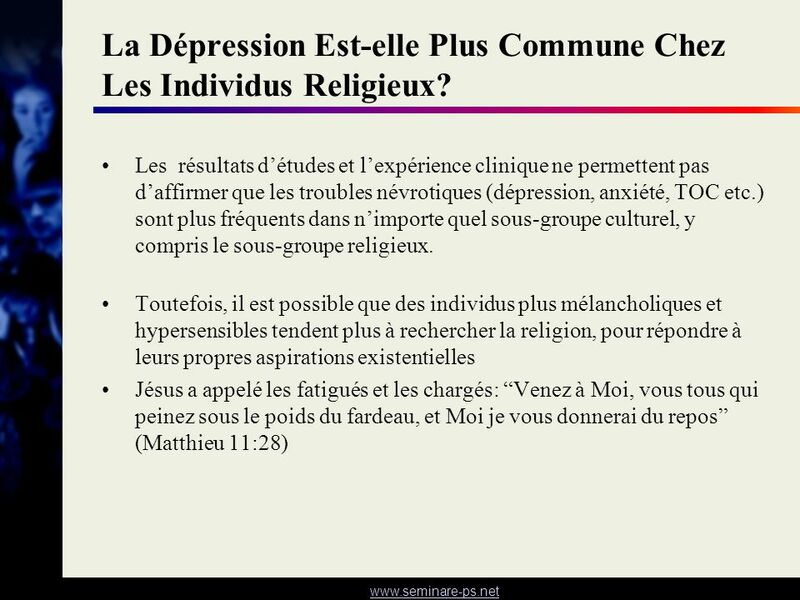 18 La Dépression Est-elle Plus Commune Chez Les Individus Religieux? 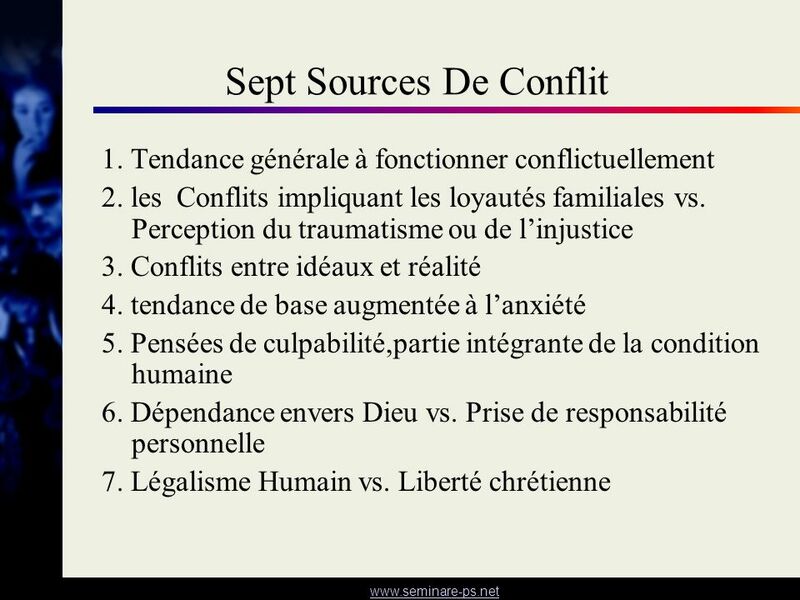 L’anxiété conduit à un fonctionnement conflictuel Conflits entre MOI, ÇA, et SUR- MOI Le Sur-Moi (MOI Idéal) peut être formé de manière négative par la religion. L’Anxiété peut en être le moteur. 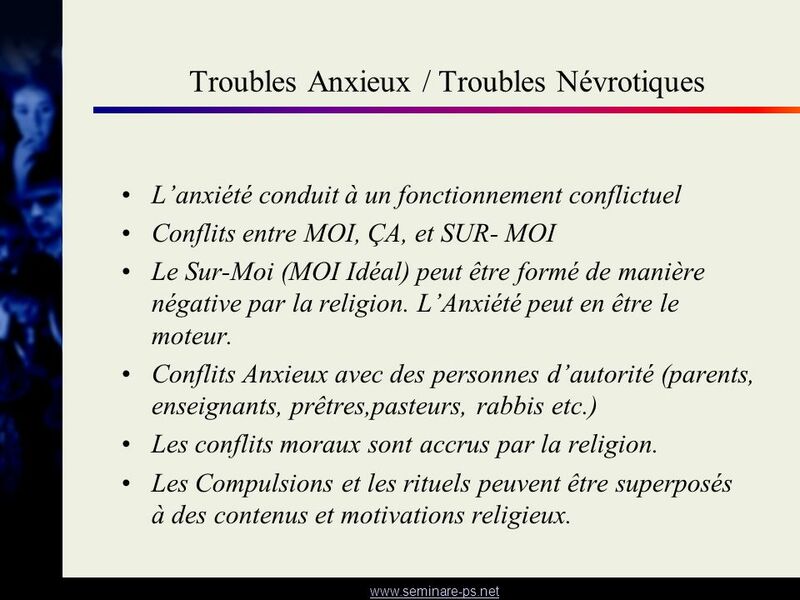 Conflits Anxieux avec des personnes d’autorité (parents, enseignants, prêtres,pasteurs, rabbis etc.) 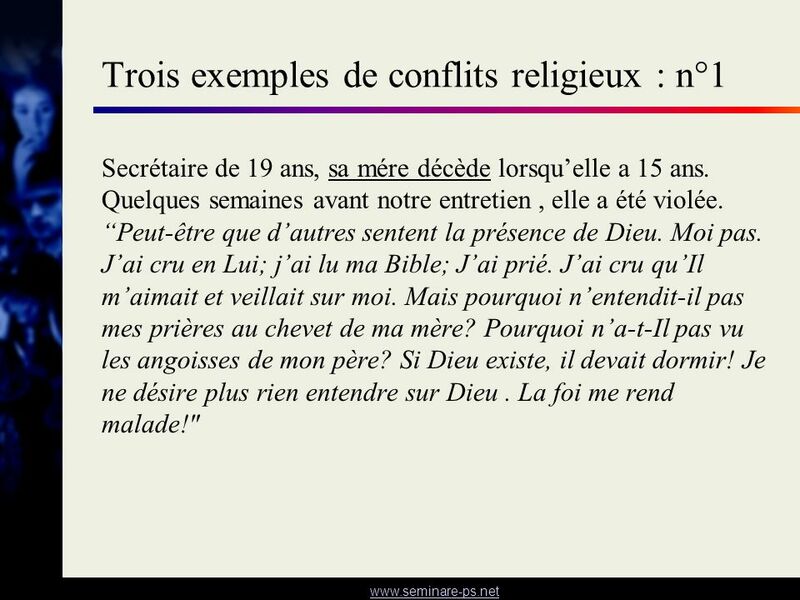 Les conflits moraux sont accrus par la religion. Les Compulsions et les rituels peuvent être superposés à des contenus et motivations religieux. Les patients névrotiques tendent à être plus anxieux, conflictuels, et scrupuleux, et moins capables de tolérer l’ambiguité Plus de combats sur la compréhension finale. Les aspects limitants de la religion (directions morales et interdictions) ainsi que les passages difficiles de l’Ecriture sont vécus comme facteurs amplifiant le conflit intérieur lors de la recherche de signification. Les Patients souffrant de symptômes névrotiques mineurs (problèmes de personnalité) sont plus en conflit avec leur vie spirituelle, certains provoquant un impact négatif sur leur bien-être. 1)Pas de corrélation significative entre religiosité et tendance à la névrose, ni dans le groupe d’étude ni dans le groupe contrôle. 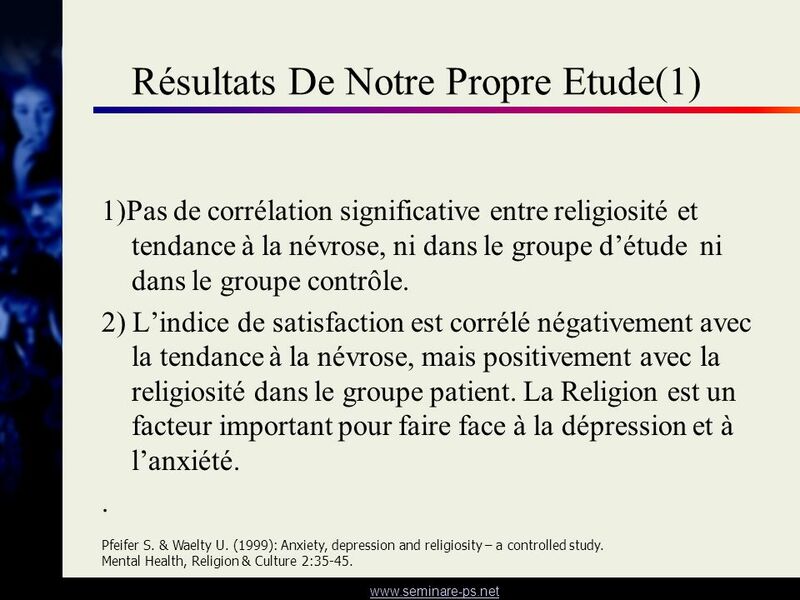 2) L’indice de satisfaction est corrélé négativement avec la tendance à la névrose, mais positivement avec la religiosité dans le groupe patient. 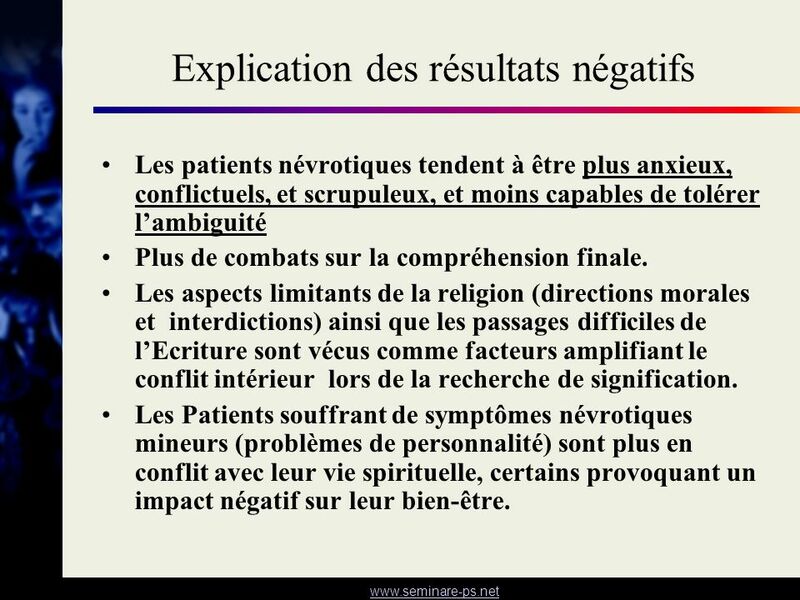 La Religion est un facteur important pour faire face à la dépression et à l’anxiété. . Pfeifer S. & Waelty U. (1999): Anxiety, depression and religiosity – a controlled study. Mental Health, Religion & Culture 2:35-45. 3) L’ anxiété concernant la sexualité, les conflits du sur-moi (conscience) et l’enseignement religieux reçu dans l’enfance sont primairement associés avec la tendance à la névrose et non pas avec la religiosité. 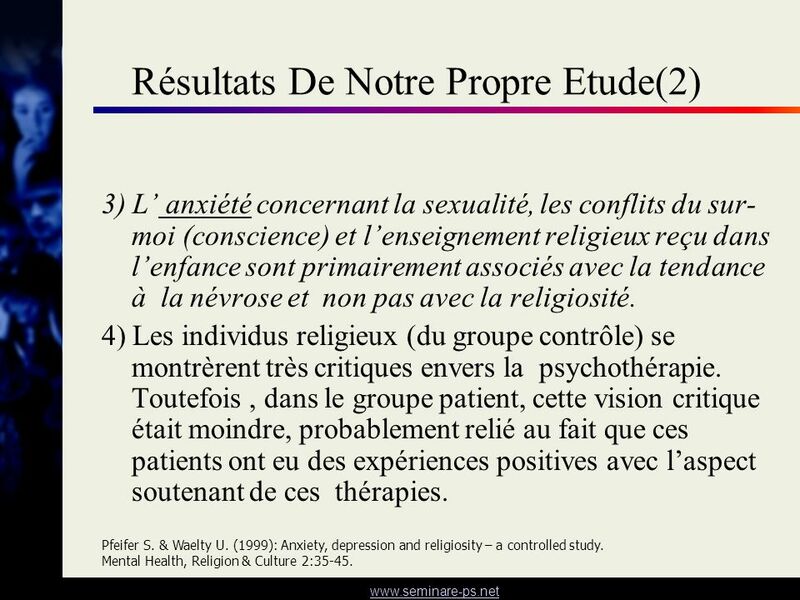 4) Les individus religieux (du groupe contrôle) se montrèrent très critiques envers la psychothérapie. 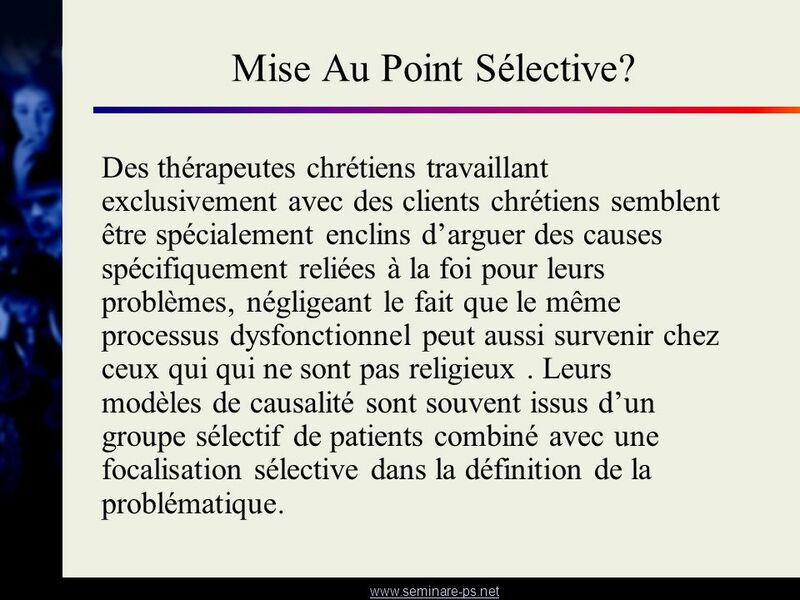 Toutefois , dans le groupe patient, cette vision critique était moindre, probablement relié au fait que ces patients ont eu des expériences positives avec l’aspect soutenant de ces thérapies. Pfeifer S. & Waelty U. (1999): Anxiety, depression and religiosity – a controlled study. Mental Health, Religion & Culture 2:35-45. 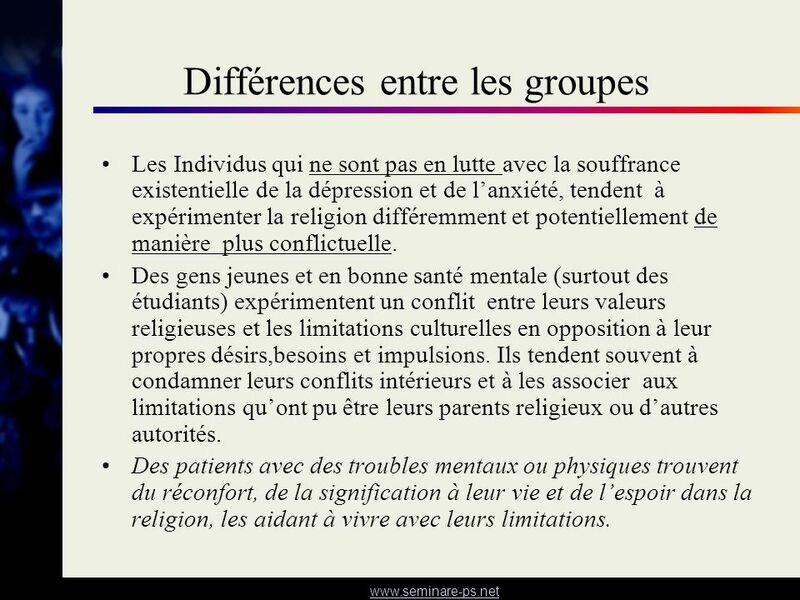 Les Individus qui ne sont pas en lutte avec la souffrance existentielle de la dépression et de l’anxiété, tendent à expérimenter la religion différemment et potentiellement de manière plus conflictuelle. Des gens jeunes et en bonne santé mentale (surtout des étudiants) expérimentent un conflit entre leurs valeurs religieuses et les limitations culturelles en opposition à leur propres désirs,besoins et impulsions. Ils tendent souvent à condamner leurs conflits intérieurs et à les associer aux limitations qu’ont pu être leurs parents religieux ou d’autres autorités. 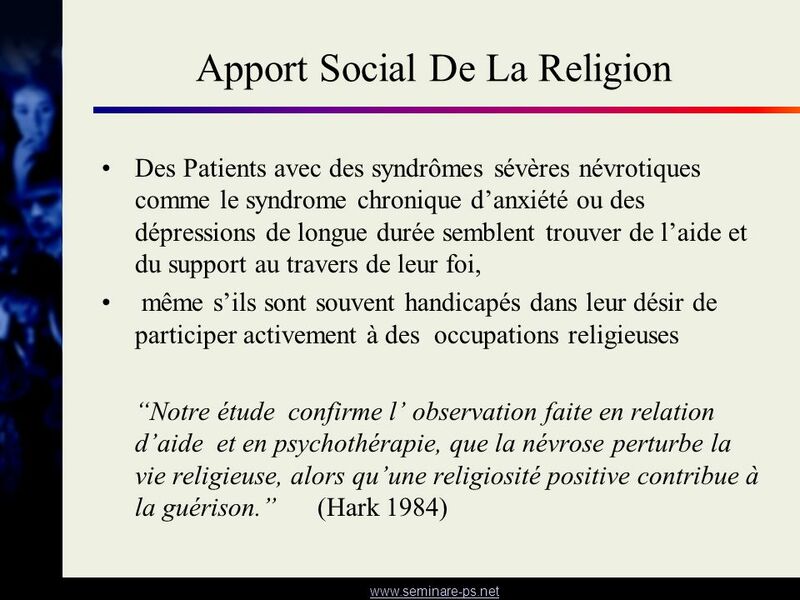 Des patients avec des troubles mentaux ou physiques trouvent du réconfort, de la signification à leur vie et de l’espoir dans la religion, les aidant à vivre avec leurs limitations. One of the suprising findings was the marked difference between the patient group and the clinically healthy control group in correlations concerning some key questions (Table 4). We interpreted this as an indication for different ways of causal attributions, values and conflict resolution in the area of religion, depending on the severity of psychological suffering. Individuals who are not struggling with the existential suffering of depression and anxiety, tend to experience religion in a different and potentially more conflictuous way. Gartner et al (1990) had already pointed out the difference between healthy subjects (e.g. students) filling out paper-and-pencil tests on theoretical constructs and "real life" patients with marked pathology that could be reliably observed and measured. Healthy subjects tend to experience the conflict between religious values and cultural limitations in opposition to their personal wishes, needs and drives, and they often tend to blame their inner conflicts on those limitations that might be represented by religious parents or authorities. In contrast, patients with mental and physical illness derive comfort, meaning and hope from religion, helping them to cope with their limitations (Koenig et al., 1992), resulting in a negative correlation between religiosity and psychopathology (Stark, 1971). 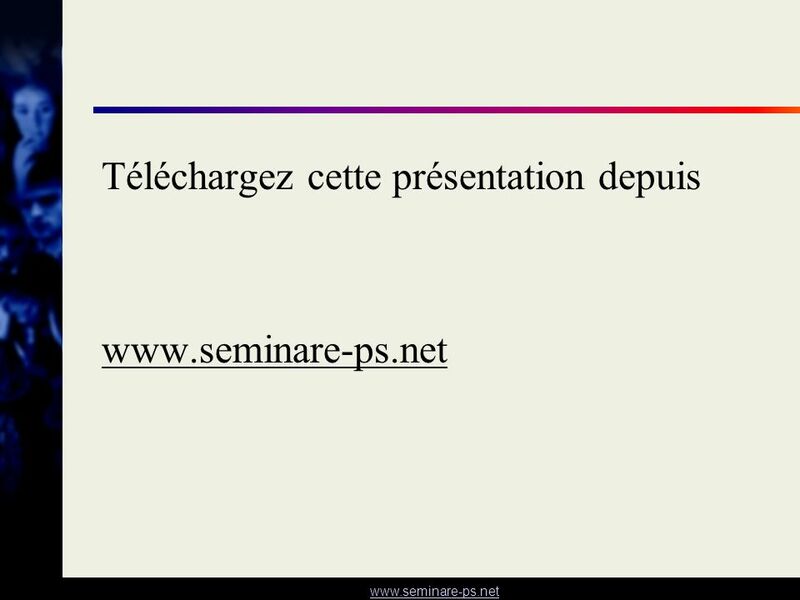 26 Conclusions Les études ne prouvent pas de corrélation entre la foi et une tendance à la névrose Des systèmes de croyance religieuse peuvent “servir de véhicule à l’expression de tendances et de besoins névrotiques.” (Meissner, 1991). 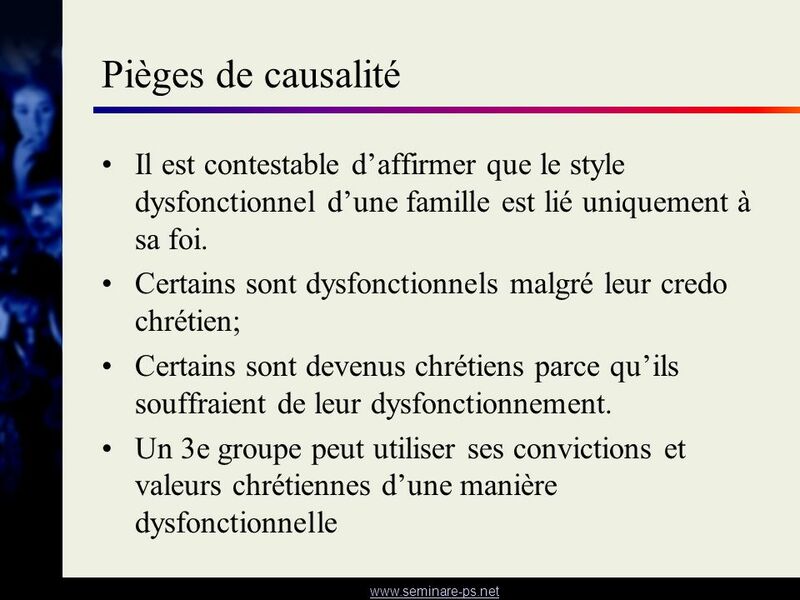 Ce ne sont pas la foi ou les églises en général qui causent des pathologies psychiques, mais la manière dont une personne gère les enseignements de son église ou de sa religion. 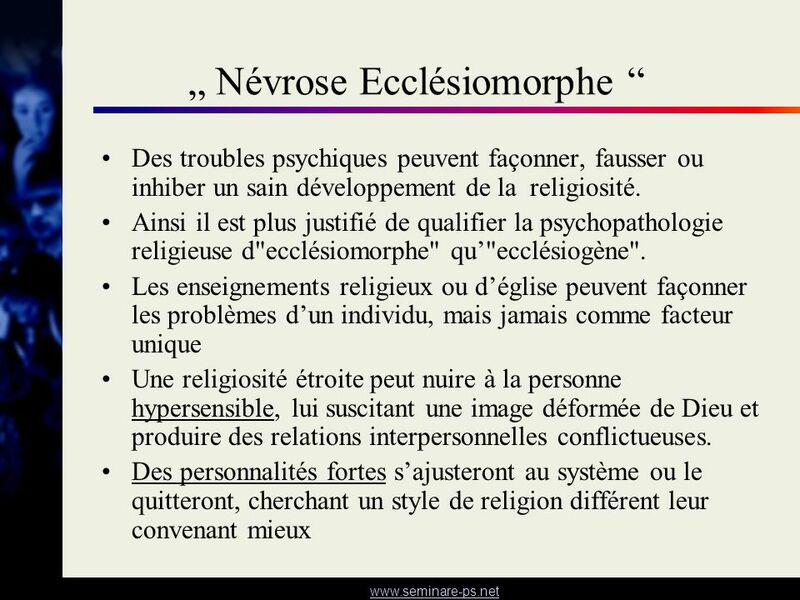 Pas toutes les pathologies psychiques observées chez un individu religieux , même présentées dans un vocabulaire religieux ou ritualiste , sont induites par la foi ou “ecclésiogènes”. 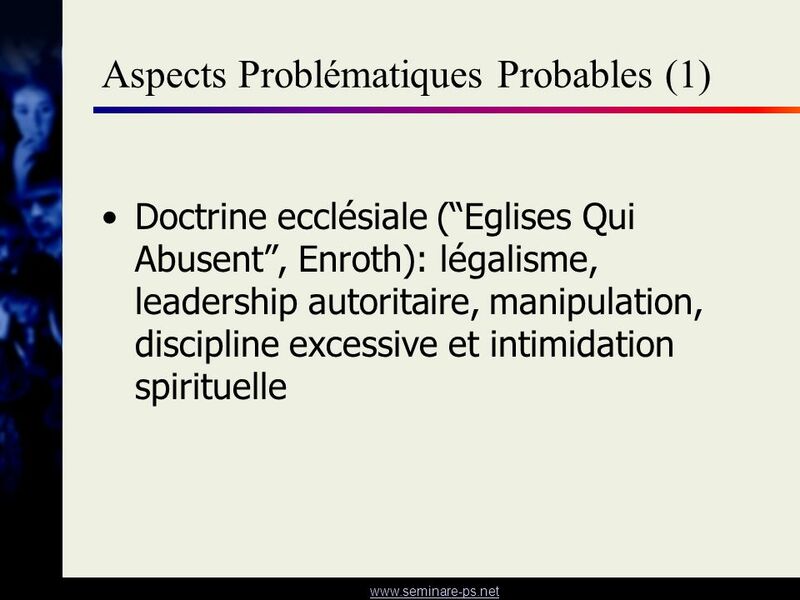 Des pensées de culpabilité, par exemple, semblent être un phénomène ubiquitaire chez des individus religieux ou non, souffrant de dépression majeure. Man könnte also sagen, die Religiosität sei eine inhaltliche Ausprägung eines grundlegenden neurotischen Prozesses, religiöser Inhalt eines pathodynamischen Gefäßes. Es wäre daher sinnvoll, den kausalen Begriff der "Ekklesiogenen Neurose" durch den Begriff "Ekklesiomorphe Neurose" zu ersetzen. Damit wird die Beziehung zwischen Religiosität von Neurose ausgedrückt, aber in einen breiteren Kontext gestellt. Der religiöse Konflikt ist nur eine Sonderform der allgemeinen neurotischen Konfliktsituation des einzelnen zwischen seinem inneren Erleben und der äußeren Welt „Consideration should be given to how patients use their religious belief systems as a vehicle for the expression of neurotic needs and conflicts, in particular to identify patterns of symptomatic and characterological expression with their particular religious phenomenology“ Meissner W.W. (1991). The phenomenology of religious psychopathology. Bulletin of the Menninger Clinic 55:281–298. 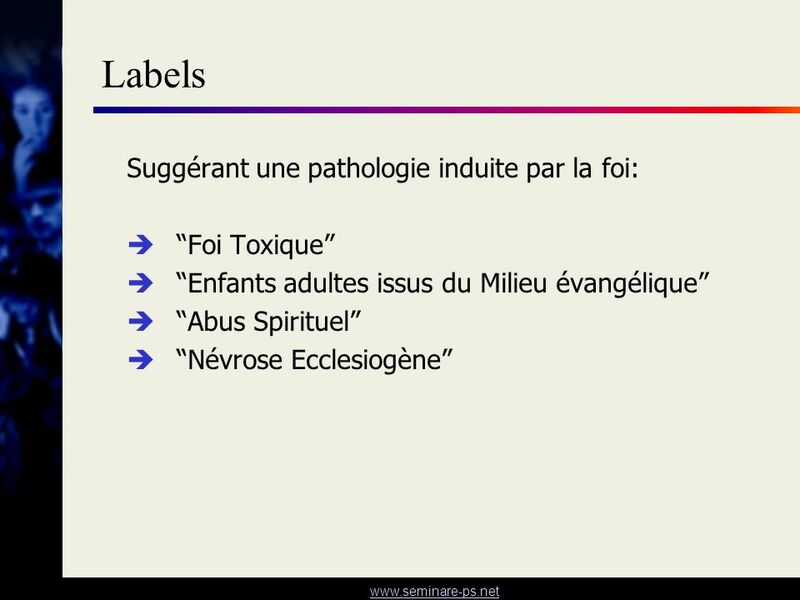 Télécharger ppt "Y-a-t-il un facteur religieux spécifique en Psychopathologie?" Jai enfin trouvé quelquun qui maime… Quand jai dit oui à mengager, jignorais lhéritage que mon (ma) bienaimé (ée) transportait dans notre couple... Jaime.